Mark Assaf and an expert from Dublin Port Company (DPC), will co-deliver the Coaching Workshop to 18 participants from Pelindo I, and the port communities of Ghana Ports and Harbours Authority, Tanzania Ports Authority and Kenya Ports Authority. This entry was posted in News, Port Certificate and tagged Indonesia, Irish Aid, Modern Port Management on October 17, 2018 by Debbie Francisco. 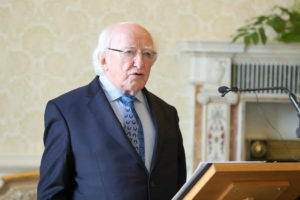 On 21 June, the President of Ireland, Mr. Michael D. Higgins received the participants of the UNCTAD TrainForTrade Port Management Programme Training of Trainers (ToT) Workshop at his official residence at Áras an Uachtaráin. Present during the courtesy call were port representatives from the English-speaking Network: Ghana, Indonesia, Malaysia, Nigeria, the Philippines and Serbia. Also joining the group were representatives from UNCTAD, Dublin Port Company, former senator, Mr. Pat Magner, TD, as well as Mr. Kevin O’Driscoll. President Higgins delivered a welcome message wherein he reiterated his support for the work of the UNCTAD TrainForTrade Port Management Programme, citing its important role to international trade. The President also commended the contributions of IrishAid and Dublin Port Company to the programme. The president then joined the group for an afternoon tea. A tour of the official residence followed. This entry was posted in News, Port Certificate and tagged Irish Aid, TrainForTrade, UNCTAD on June 25, 2018 by Debbie Francisco. In the framework of the UNCTAD TrainForTrade Port Management Programme (PMP), a Training of Trainers (ToT) Workshop for the English-speaking network will be held from 19 – 26 June 2018 in Dublin, Ireland. The workshop is co-organized by Dublin Port Company, with the support of Port of Cork Company, and Belfast Harbour Commissioners. It will be held at the head office of Dublin Port Company and the National College of Ireland (NCI). 17 senior managers from the member ports of the English-speaking network of the Programme (Indonesia, Ghana, Malaysia, Nigeria, and the Philippines), as well as prospective port members (Serbia) and former member (Namibia) will be exchanging experiences and knowledge on the contents and delivery of modules 1 – 4 of the course on Modern Port Management. UNCTAD Secretary General Mukhisa Kituyi, will take part in the closing ceremonies of the workshop to distribute the certificates to the successful candidates. The ToT face to face workshop is the completion of the course that had started with a distance learning component which took place from 30 April – 8 June 2018, and represents a new blended learning strategy being implemented in the PMP. The objective of the workshop is to prepare the senior port managers for their roles as future instructors in their port communities. The participants will also have the opportunity to take part in a technical visit of Dublin Port. The English-speaking network of the Port Management Programme benefits from the kind support of Irish Aid. This entry was posted in News, Port Certificate and tagged Irish Aid, Modern Port Management on June 5, 2018 by Debbie Francisco. Port experts from the Philippine Ports Authority (PPA), and an expert from Ireland, will co-deliver Modules 7 & 8 of Cycle 4 of the Port Management Programme (PMP) in Indonesia. 16 participants (including 2 women) from the port community of Pelindo I to IV are taking part in the Modern Port Management course. The said modules of the Modern Port Management Course, comprises topics on Administrative and Legal Management and Technical Management and Human Resources Development, respectively. Indonesia is currently on the 4th cycle of the programme. This entry was posted in News, Port Certificate and tagged Irish Aid, Modern Port Management on March 5, 2018 by Debbie Francisco. From 7 to 9 March, Mark Assaf and a port expert from Dublin Port Company, as well as senior managers from Ghana Ports & Harbours Authority (GPHA) will take part in the juries that will assess the case studies of 24 managers from the port communities of Ghana. The participants have successfully completed the 8 modules of the Modern Port Management Course. Those who pass their dissertations will receive UNCTAD’s Modern Port Management Certificate. Moreover, the top three best dissertations will have the opportunity to be featured in the upcoming Port Management Series. Ghana is currently undertaking the fourth cycle of the Port Management Programme. This entry was posted in #Ghana Ports and Harbours Aurhority, News, Port Certificate and tagged Irish Aid, Modern Port Management on March 2, 2018 by Debbie Francisco.